Have you been watching the 2014 Winter Olympics? I’ve been looking forward to the games for months now and it’s hard to believe that we’ve nearly completed the first week. I’ve been watching the Olympics since I was a child and I still well up with immense excitement and emotion as I find myself becoming invested in the athletes and their stories. Last Fall, I had the honor of meeting ice dancing duo Meryl Davis and Charlie White in New York City. Not only are they passionate and dynamic, they are exquisite and compelling to watch on the ice. 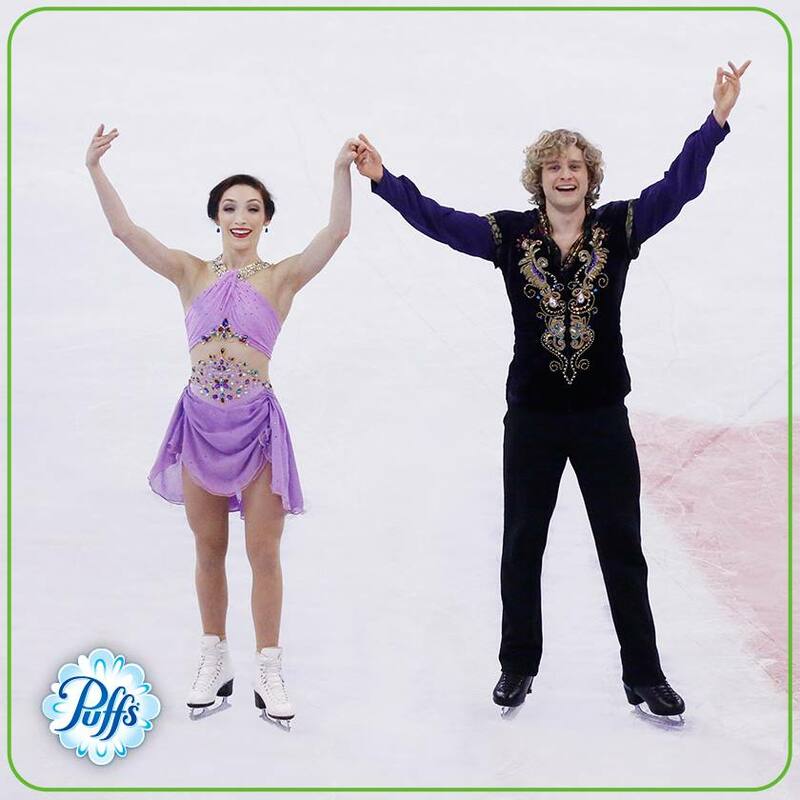 Davis and White have been skating together since they were ten years old which is why they seem so natural and in sync. Davis and White achieved a silver medal at the 2010 Vancouver Olympics, but this year, they seem determined to win the gold! At present they are in the lead which places them in an optimal position for Monday’s free skate which will determine medals. If they do in fact win the Gold this year, they would make American history by becoming the first ice dancing Olympic Champions. As the longest-running ice dancing partnership in the history of US figure skating, Davis and White know much about what it takes to get to the Olympics. They have trained for years together, at times under harsh winter conditions. Knowing that the world will be watching, the duo have partnered with Puffs to help them put their best faces forward. Soft and versatile, these facial tissues are designed to be gentle on skin and the only brand tested by dermatologists. Whether you’re shedding tears of joy or your skin is suffering the effects of harsh winter weather, Puffs is the everyday tissue for all of your facial care needs. I watched Davis and White’s story about their journey to the 2014 Winter Olympics, and it was touching to hear them attribute their success to their moms. For the 2012 London Olympics, P&G created “Thank you, Mom,” which seeks to recognize the important role of the Olympic athletes’ mothers, and this year they have continued the campaign. Many of the athletes had their Olympic start as a child and these mothers have been there every step of the way to help them make their dreams a reality. Cheryl Davis and Jacqui White have supported Meryl and Charlie, wiping tears of joy and defeat, and I think it is honorable and inspirational that P&G has taken so much care to recognize their compelling role in the athletes’ success. Davis and White will compete again tomorrow during the Free Skate. Will you be watching? Be sure to keep up by following Puffs on Twitter and Facebook! Win It! TWO of you will win ultimate Winter Olympic baskets from Puffs filled with beauty products to help you put your best face forward this winter season. Simply complete the Rafflecopter form and leave a comment with your favorite 2014 Winter Olympics Sport. Comments will close on February 28th, 2014 at 11:59 PM PST. Ice skating has always been my favorite! Fun contest! My favorite winter olympic sport is figure skating. I always look forward to watching the Hockey. Yesterday I watched the slopestyle snowboarding and that was fun to see. I like the ice dancing and hockey. Figure skating is my favorite. Thanks for the chance to win! I like freestyle skiing the best. Men’s Olympic ice hockey is by far the best! Figure skating is my favorite. My favorite is the figure skating. I like the ice dancing! I like the half pipe stuff! My favorite to watch is the bobsledding! I love all of it with the exception of Hockey (don’t hate me), but my favorite is Figure Skating ~ all figure skating! My favorites are figure skating and ice dancing. I have the most fun watching them. thank you. Snowboarding, but I love watching all of the Olympics. I love to watch figure skating. My favorite winter Olympic sport is the figure skating. Figure skating has always been my favorite! I enjoy them all but there is something about Hockey that just gets me into it! I like the ice skating best. I love the snowboarding competition. I get a kick out of curling. I don’t understand a lick of it. I love to watch the speed skating! I enjoy watching Figure Skating! Oh I loved the ice skating! The Ice Dancing was so good!!! I like the figure skating. Ice skating and figure skating are two of my favorites. I love the figure skating–especially ice dancing! Short track is up there too! I love figure skating the best specifically pairs and ice dancing. I love the ice skating – all of it.